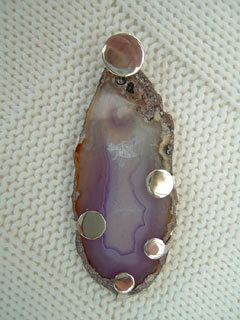 The design for this pendant was a direct response to the pattern in the stone. The polished flat agate slice is held by a silver frame that covers only the edge allowing the light to shine through the translucent stone. The pendant hangs from the top disc which supports a rider link at the back.